Manchester United's Michael Owen is set to be out until at least Christmas with the thigh injury he sustained in the 2-0 win against Otelul Galati. The England forward, 31, lasted 10 minutes before suffering the problem in the build-up to United's opening goal. 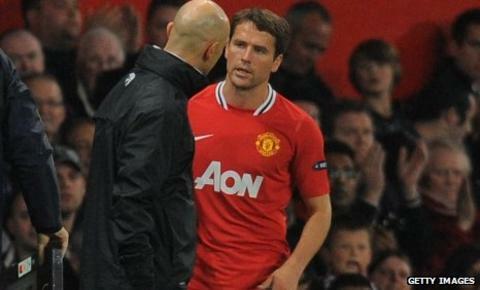 "Michael has a thigh muscle injury and will be out for six weeks or so," a club spokesman told manutd.com. According to the club, Owen will be unavailable until Boxing Day at the earliest when Wigan visit Old Trafford. The former Liverpool, Real Madrid and Newcastle player has rarely featured in United's league games this campaign and his current contract expires at the end of the season. However, he has featured in the League Cup and scored two goals to help United beat Leeds 3-0 in the third round of the competition. Owen signed a two-year deal with the Old Trafford club in 2009 having been available on a free transfer. The striker then agreed to a new one-year extension last summer.